Mark Andrew Spitz (born February 10, 1950) is an Olympic swimming champion from the United States. Spitz won 7 gold medals in swimming at the 1972 Munich Olympics. Spitz won 2 gold medals in the 1968 Mexico City olympics. In 2000, Spitz was voted Athlete of the Century in water sports and one of the six greatest Olympians ever by Sports Illustrated. The International Olympic Committee selected Spitz as one of its five athletes of the Century. Winner of 2 gold medals in the 1968 Mexico City olympics. Spitz won 7 gold medals in swimming at the 1972 Munich Olympics. Mark Spitz lives with his wife Suzy and two sons Mathew and Justin in Los Angeles, California. Mark now works as a stockbroker and financial adviser in addition to giving motivational speeches. 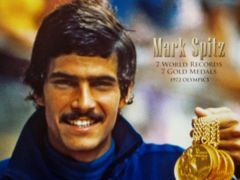 "Mark Spitz." North American Biography, Volume 2. 1994. "Super Swimmer Mark Spitz." People Weekly Magazine. January 15, 1990. pp. 86–88.
" Bionic Man." Sports Illustrated Magazine. October 23, 1989. pp. 80–82. This page was last modified on 27 July 2016, at 09:53.